The Mayo Litter Action League was first introduced to the public in November 2002. The competition is open to Tidy Towns Committees and Community Groups in all towns and villages in County Mayo, with the exception of the towns of Ballina, Castlebar and Westport. It is run on a league basis, i.e each of the participating towns and villages compete against all other towns and villages in its group in successive months. The purpose of this initiative is to encourage Local Community Councils and tidy Towns Committees to further their involvement in the eradication of litter in towns and villages in County Mayo. The competition also helps to raise awareness of the extent and effect of litter in local communities with awards being given to the winners and runners up. We would ask all business’s and shops, you might help us out by downloading the monthly results for Swinford and print them to display for your customers and the public, thank you. 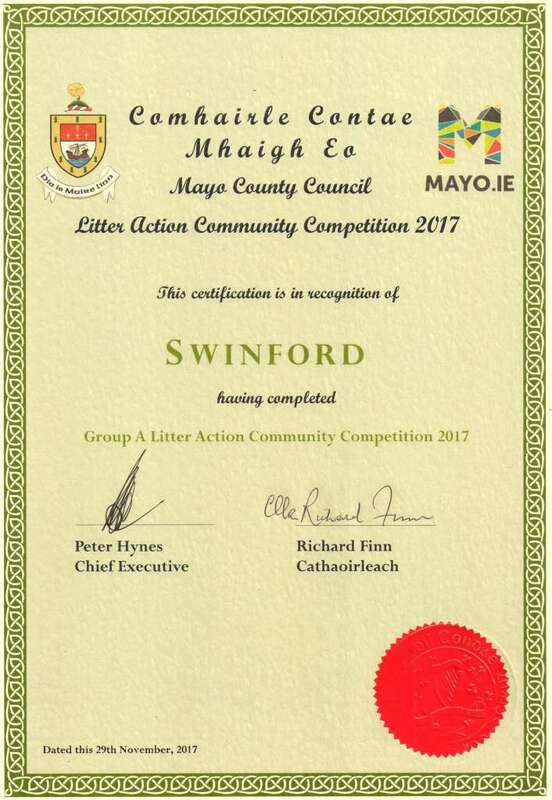 Swinford results for May in the 2017 Mayo Litter Action League competition. Mayo Litter Action League June results for Swinford.